The first below ground storm shelters were Grandma and Grandpa’s root cellars where people stored their canned goods. Then, around 1955 someone put a door on a concrete septic tank and began marketing the shelters that are partially buried out in the yard and are still offered today. On May 3, 1999 an EF5 tornado struck Moore, OK that had record wind speeds of over 300mph. After that 1999 tornado, we realized that not everyone had the space to install a septic tank shelter. People had very, very limited choices with respect to protecting their families from tornadoes. Immediately thereafter, the first generation of the in-garage, below ground storm shelters was born. This allowed for the masses to install a shelter in their home for tornado protection. This was a good idea for sheltering people and keeping them out of the weather but it had its downfalls. 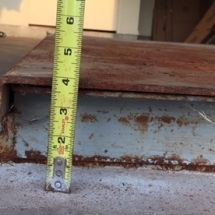 It stuck up 4 to 5 inches off the garage floor, had poor ventilation, rusted out quickly, and had steep, awkward ladders for entry and exit. Many of these shelters weren’t installed properly and have actually floated up out of the ground due to buoyancy and ground water. So, in 2003, the FlatSafe Tornado Shelter was invented. We engineered our below ground storm shelters, to be installed in-garage to deal with the destructive forces involved with tornadoes that would give our customers peace of mind and provide them with the highest probability of survival in an EF5 tornado. Through extensive research, we identified vacuum, air pressure, and debris as the most destructive forces involved with tornadoes. Vacuum: With potential wind speeds of 300+mph in mind, we recognized that vacuum is one of the most damaging forces that tornadoes create. It does not take much vacuum pressure, with respect to psi, to cause structural damage. To counter vacuum forces, FlatSafe designed a lid system that allows for 360o of ventilation for rapid equalization of pressure within the shelter. By promoting the pressure inside of the shelter to quickly equalize with the outside pressure, the secured lid system is held firmly closed. Pressure: We recognized that 300+mph winds can cause tremendous damage to anything it slams against so we sought to reduce our exposed surface area as much as possible. The patented FlatSafe lid system only sticks up ¼”, so there is very little surface area affected by horizontal wind speeds. Debris: Because FlatSafe Tornado Shelters are below ground, it is out of the way of horizontal winds and the debris thrown and circulated by it. So the only debris to worry about is falling debris. We knew that all debris falls at the same speed and only mass determines its impact. Our ¼” plate lid is larger than the shelter opening and is reinforced to absorb and withstand any falling debris that might land squarely on it. We designed it to provide more than adequate ventilation (breathing) even after impact. The FlatSafe Tornado Shelter was engineered to meet all of the regulations and criteria that were available. 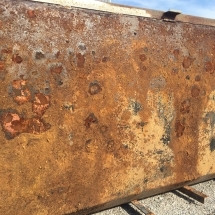 It was also engineered with corrosion protection options to ensure that the shelter would last as long as the home and the homeowner. FlatSafe provided the original single-lid design and was the first low-profile, in-garage shelter offered. 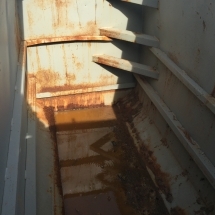 FlatSafe was the first to encase shelters in ready-mix concrete to counteract buoyancy and floatation. 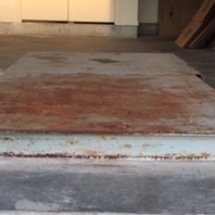 The FlatSafe shelter design does not take away from a homeowner’s usable garage floor space. FlatSafe below ground storm shelters allow for easy entry and exit, provides a powerful system for exiting with debris on the lid, and leaves the customers with the peace of mind that they have a very high probability of surviving a direct hit from an EF5 tornado. Since 2003, FlatSafe has established itself as the innovator in the in-garage, low profile, below ground storm shelters industry. Several FlatSafe shelters have taken a direct hit from an EF5 tornado and our customers rave about the shelter performance and their choice to purchase. FlatSafe continues to push for new innovation and continues to push for more stringent and thorough codes to protect the customers in our industry.